Summer BBQ season is here. I usually leave the meat grilling to my husband, and focus on side dishes. This baby bok choy salad would be a great side with almost any main course. Combine bok choy, carrots, beans, and onions in a large bowl. Top with almonds and chow mein noodles. Serve immediately. On this Memorial Day, remember those who died in service to the USA. 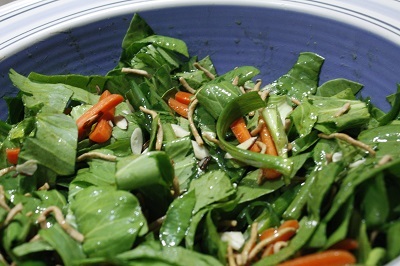 This entry was posted in Salads and tagged bok choy, carrots, green beans, green onions on May 25, 2015 by Ruth.